As part of a series of lessons on shape and angles with year 6 I taught a lesson on drawing 2D shapes with given angles and side lengths. We had previously struggled with using protractors LOTS but this lesson was a bit of a tying-it-all-together lesson at the end of the unit. 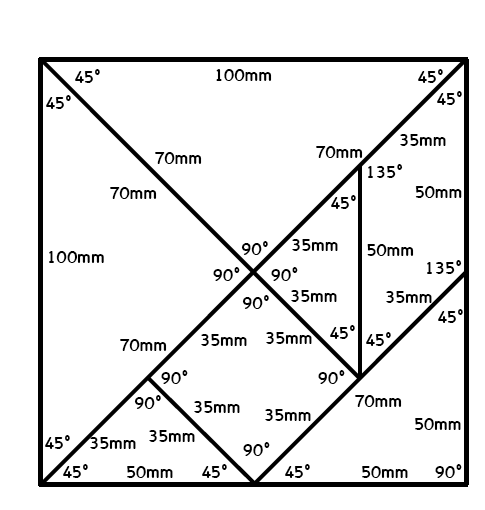 What I noticed particularly about teaching this part of maths was that often it was the supposed “top group” who struggled most with the spatial aspect of this work. Maybe this is an argument for concrete and pictorial maths through to year 6 and maybe also a great demonstration of why “top groups” can be completely the wrong model sometimes. Anyway, I was to teach phonics in reception that morning until right at the start of the lesson so I decided to start with an activity that pupils could get on with easily under TA supervision, just in case I was late. As it happened my phonics finished about 2 minutes late so I ran straight from reception to year 6 and straight into my year 6 maths lesson starter, which was a bit of an extreme gear change! 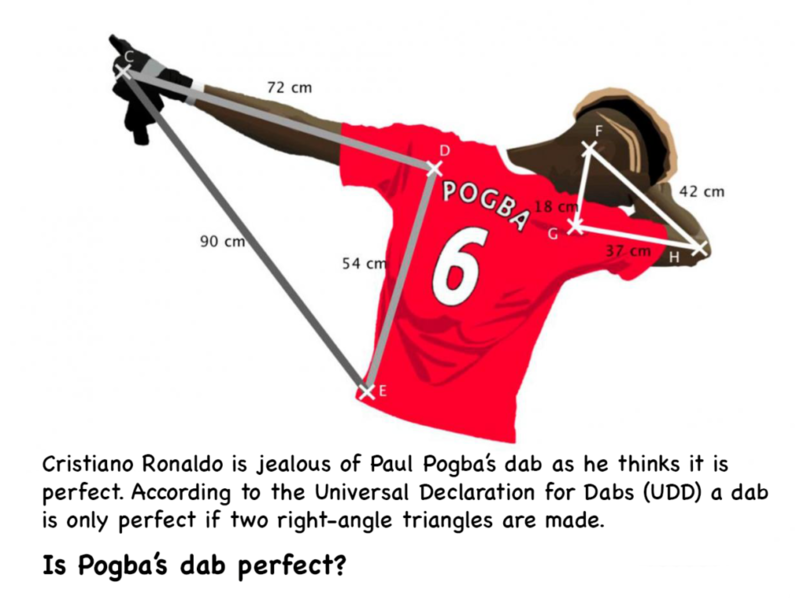 This was originally looking for pupils to use Pythagoras but I thought gave a great opportunity to draw the triangles instead. This question required pupils to recognise that they had to scale the dimensions down by 10 times, which we had also recently done. Then they had to measure accurately and try to find an efficient and accurate way of orienting the lines in order to make the shape. What was really interesting was the way pupils talked to each other about this and in several cases independently sought other opinions on strategy but would not let me tell them the answer until everyone had their own solution, over about ten minutes. I’ll let you find your own answer . After this I introduced pupils to tangrams but rather than just making pictures, pupils had to then accurately draw their pictures using the scale of the labels, not the shapes which were a little bit smaller, I’m cunning like that :D. Because pupils were drawing geometrical cats and fish and boats and everything else they saw the whole picture as a singular piece of work rather than each of the seven constituent parts. That in turn meant that pupils seemed to forget worrying about an individual triangle and got on with drawing cats. 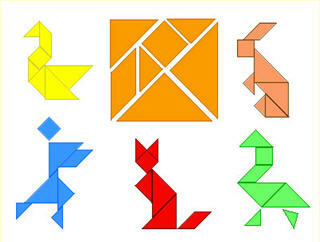 Several pupils asked me if they were ok using so many pages of their books because they had drawn so many (30-40 accurate primitive shapes in under 30 minutes) and in many cases the progression in drawing accuracy from the first to the last tangram was stark. To end the lesson I asked pupils to open their books at their best drawing and do a gallery walk to see what everyone else had done. I told them I would want to hear who had impressed them most and it was great to hear many less confident pupils praised by their peers. I was really pleased with this lesson (or I wouldn’t be blogging about it I suppose ) but it taught me a lot also. All I really did in this lesson was set up two simple open tasks with no tiers of differentiation or other fluff, I didn’t even really talk to the class apart from to introduce the tangram task and gallery walk. What I think I did well, and will try to recapture in future lessons, was to catch pupils’ curiosity while both empowering them to achieve and also challenging them. Easy right .